Over the years, I have installed several submerged float switches in the bilge of my boat. They’re supposed to run the bilge pump when the level of water in the bilge exceeds a certain level and then stop the pump after the water level is lower. They usually work well for the first year or two but inevitably fail. Sometimes they fail simply because they’re submerged in water constantly and they had a very small leak. Other times they failed probably because I left them underwater over the winter and they were frozen. To improve upon this I wanted to switch, pun intended, from a submerged mechanical switch to a solid state, adjustable switch. I wanted to be able to remove as much of the switch from the water, hoping to extend its useful life. Of course there are a few commercial switches available but they’re not always customizable. Also, buying a packaged switch wouldn’t teach me anything about the circuitry required or give me the intimate knowledge on how they work. Now, giving credit where it’s due, none of the circuits in my implementation are completely my own. I borrowed liberally from others who have gone before me. My design has two components and I used someone else’s circuit designs for both. My “value add” was the combination of the two circuits and the replacement of a fixed resistor with a potentiometer, in order to make the switch adjustable. Before I dive into the design of the circuits, a bit of background may be useful. The level of water in the bilge of a floating boat is not a stable thing. Most importantly, the level rises and falls, not always predictably. The average level of the water may stay the same over longer periods of time but the water can slosh back and forth. Both of these properties can confuse a simple water level sensing switch. There is a simple solution to this problem though. If the level of the water is sensed by allowing the water to conduct between two electrical probes, setting the height of those probes above the water is important. In short, the pump must be able to reduce the water level to below the height of the probes. Otherwise, the pump will start as soon as the water level rises to, or sloshes against, the probes. The pump will then run and reduce the water level just enough to break the circuit between the probes and stop the pump. But then, possibly within a few seconds the water level will rise, or slosh, closing the circuit between the probes and running the pump for a few seconds again. This cycle will likely continue indefinitely. However, if the probes are well above the lowest possible water level and if the pump can run long enough after the probes are above the water level to reduce the water to that lowest level, then the pump is much less likely to rapidly cycle between off and on. If you’re understandably concerned about the pump stopping when the water is running into the bilge non-stop, have no fear. As long as the probes are submerged, the pump will never stop, at least as long as it has power. Now we can jump into the actual circuits. The first part is the water level sensor. It’s the simpler of the two circuits but possibly the more important part. I started with a circuit from Gary A. Pizl, described at http://www.mhsd.org/model/autopump.htm. If you look closely at Gary’s design, he has the switch connected directly to the pump. His design has the problem of continuously cycling on and off as the bilge water sloshes. 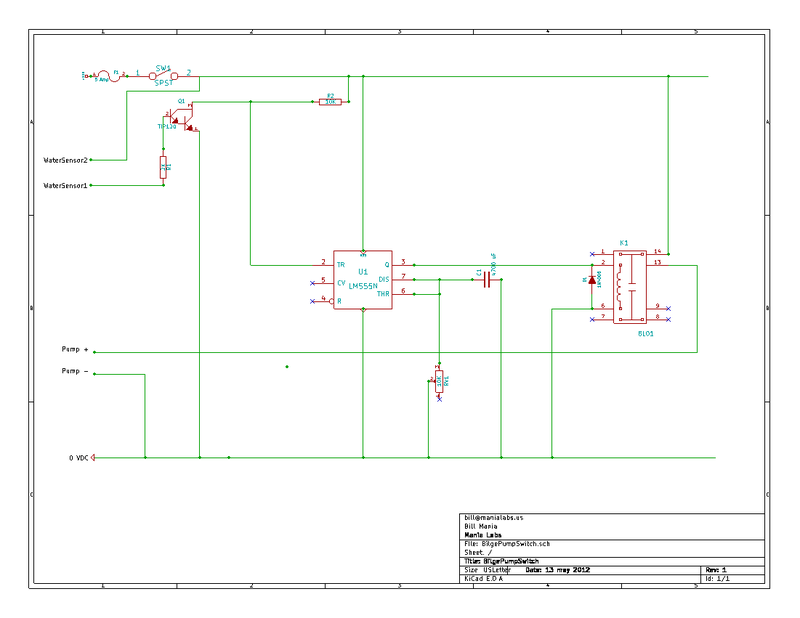 To improve upon that design I disconnected the circuit from the pump and instead connected the output of the circuit to a timer circuit, described in the next paragraph. 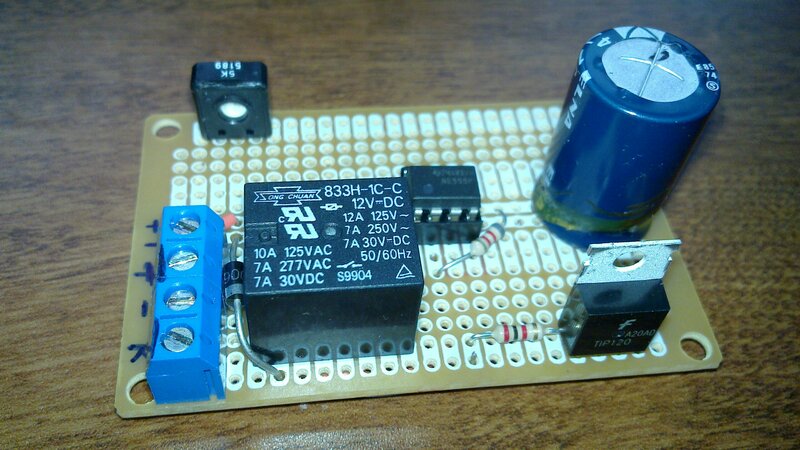 The initial circuit for the timer was taken from John Hewes’s monostable design at http://www.kpsec.freeuk.com/555timer.htm#monostable . I made a few modifications to it, however. I didn’t need the reset capability, because I could simply cut the power to stop the timer. I also found that it works just fine without pulling pin 4 of the 55 high with the resistor to positive voltage. I didn’t put the small capacitor on pin 5 either. The major change was to the value for resistor R1. Instead of using a fixed resistor, I used a potentiometer. That way I could adjust the length of the timer. Bill,I understand the problem and believe that we at SeaSense are on the way to providing a solution that not only takes care of the situation you have described but goes even further. every 90 seconds drawing on the battery ) to sense water , another problem we have overcome is the problem of stray 12V current being present some times in a salt water solution ! As you can imagine this would throw the older switches into defib causing the switch to fail. In answer to the problem of the sensor cycling on and off we designed a system to address this issue. Since I like to work from my 42 GB trawler I spend time thinking of ways to eliminate irritating issues of which one has been my frustration with the lack of being able to pump out all the water from my bilge due to a low spot that is never totally dry . With this in mind I worked with our R&D division and we are ready to introduce an additional product that allows for using my large 1500 GPH pump but also a smaller pump designed to pump the remainder of the water out leaving the bilge dry. But being the non mechanical type I did not wish to cut another outlet for a 3/4″hose now this can be done with my existing 1 1/8″ discharge hose ! Since we have just applied for a design patent I will be vague for now on the actual design. In order to utilize using just my 1 1/8″ discharge hose our new device is designed to not only use the above hose but will also eliminate all back flow of water into the bilge . Summarizing finally , our new solid state switch which by design can be mounted almost to the bottom of the bilge and with the use of a 350 existing pump( or you can also purchase from SeaSense our new pump which will be designed to mount in a small space low in the bilge) then connecting to your existing large pump using our new connector now both pumps will use the existing 1 1/8″discharge hose already installed . Now we have eliminated both the failure of using the old float switch also solved the constant cycling you referred to by using our new Solid State electronic switch mounted as low or high as you wish . to eliminate the recycling with the use of our new connector allowing for the mounting of a smaller pump to drain the bilge dry without back flow , all for less then 100.00 ( does not include the main pump ) . Best of all , all products that we manufacturer are covered by a lifetime limited warranty ! How can you lose? I welcome anyone’s thoughts .